I don’t know much about football, but I do know that the Super Bowl is a pretty big deal. Now, I’m not completely oblivious: I do go to a college that has a really great team (Go Bruins!) and the vibe from games and football watching parties is enough to make me a fanatic, even if only for a few hours. This Sunday, the Seattle Seahawks will face off against the New England Patriots in Super Bowl XLIX to not only decide an argument as old as time (West Coast vs. East Coast) but, more importantly, who will be the NFL champion of the 2014 season. Whether you’re throwing the bash or attending it, we all know the importance of choosing a side and dressing in their colors. If you’re not sure about what to wear, read on for some outfit ideas that display your personal style and show off your love for your team. The greatest part about these looks? They include basics you probably already have in your closet, plus each one costs less than $100. Football-viewing parties are always casual, and full of jerseys and team colors. Instead of wearing the typical team jersey, go the non-traditional route by choosing leggings and an oversized white tee, then making accessories your focus. 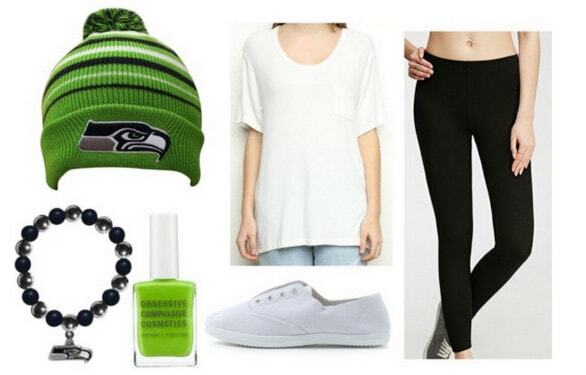 In this case, a bright green Seahawks beanie and a cute bracelet. Finish the look with a nail polish that shows what colors you truly bleed. If you consider the Seahawks your mortal enemy and you’d rather be wearing red, blue, silver, and white, choose blue jeans, a white boyfriend-style cardigan, and a comfy Patriots v-neck tee. 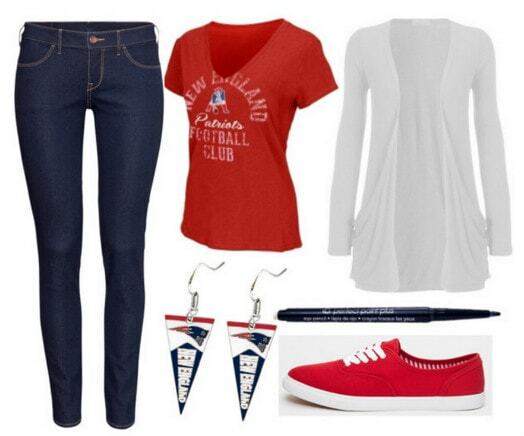 Accessories always amp up an outfit, even a casual one like this, so swipe on some blue eyeliner, slip on a pair of bright red sneakers, and don’t forget Patriots earrings! What have you chosen to wear this Sunday? Are you all about the Seahawks? The Patriots? Or will you be staying neutral? Which outfit above is your favorite? Remember to let us know your thoughts in the comments below!